Natural gas is used for space heating, water heating to provide the additional heating required for solar thermal preheated water, and for cooking. 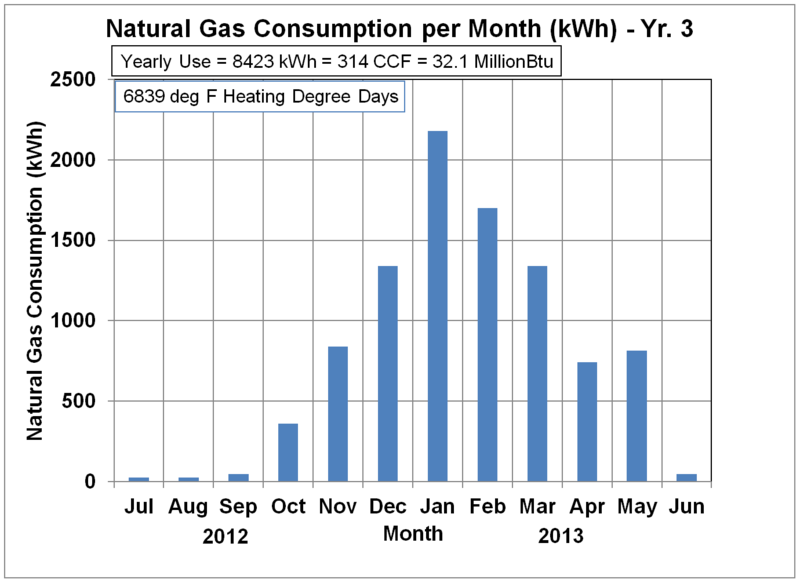 The water heating requirements are discussed under Energy Use Details - Solar Thermal. The amount of gas used for cooking is unknown, but assumed to be small. 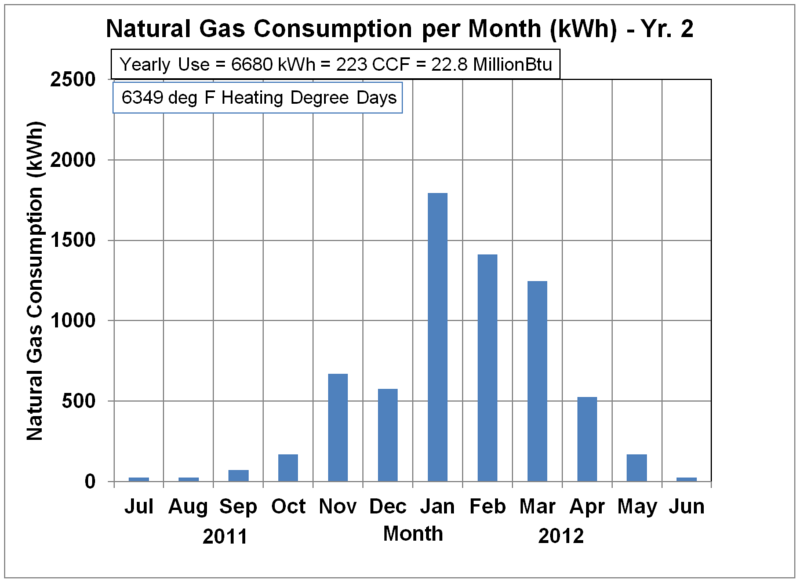 Therefore, the discussion in this section is mostly focused on the natural gas usage for space heating. To repeat some of the information given in the House Construction Details section, the house is single story with a conditioned crawl space, with the first floor living space of 149 m2 (1602 ft2) based on outside dimensions, with a ceiling height of 2.74 m (9'). The conditioned crawl space is about 1.22 m (4') high, and is insulated on the walls and underneath the gravel that forms the floor. During the heating season, the thermostat is usually set at 19.4°C (67°F) from about 0600 (6 AM) to 2230 (10:30 PM), and is set to 17.8°C (64°F) during the sleeping hours. The average daily temperature profiles for the REL location are given in the first figure below in degrees C and in the second in degrees F. A line is also shown where is was assumed that when the average daily temperature dropped below this value, that space heating would be required. This information was used to size roof overhangs for the passive solar heating. The heating degree days (HDD) for this location are variously reported as 4086 HDD in deg. C (7355 HDD in deg. F) to 3916 HDD in deg. C (7049 HDD in deg. F). For this latter figure, there are also data for the effect of base temperature on HDD, so that figure will be used here. 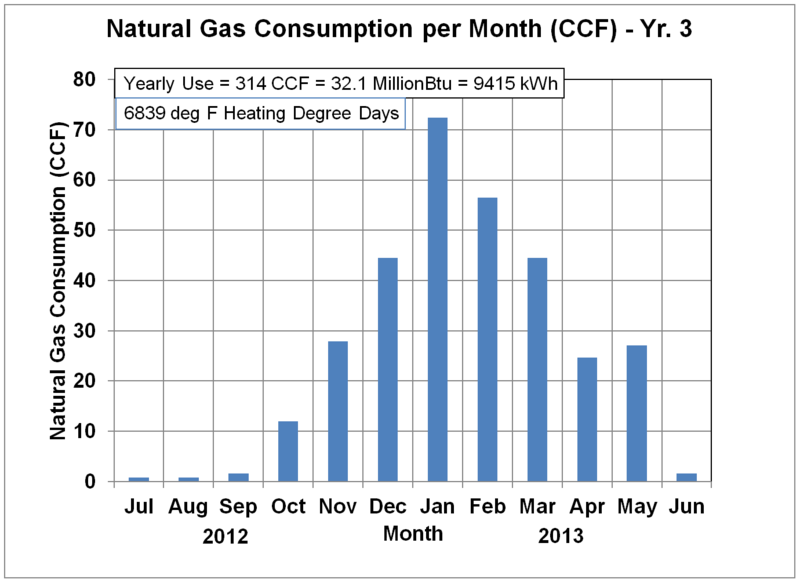 The natural gas usage measured to date is shown in the first four figures below in kWh for years 1 through 4, and in the next four figures in CCF (hundreds of cubic feet of natural gas) for years 1 through 4. Natural gas bills are typically from the 17th of one month to the 17th of the next, and these data are plotted for the second of these months. It is interesting to compare these results with those of other houses. There are some benchmark data for housing stock in the U.S. as of 1997 provided at homeenergy.org at one time, and these results are shown in the table below. The cumulative natural gas consumption at the Residential Energy Laboratory from June 17, 2010 to June 17, 2011 was 6608 kWh or 220.3 CCF. The actual heating degree days for this location are difficult to find, so the average heating degree-F days of 7049 is used (actual was probably less). 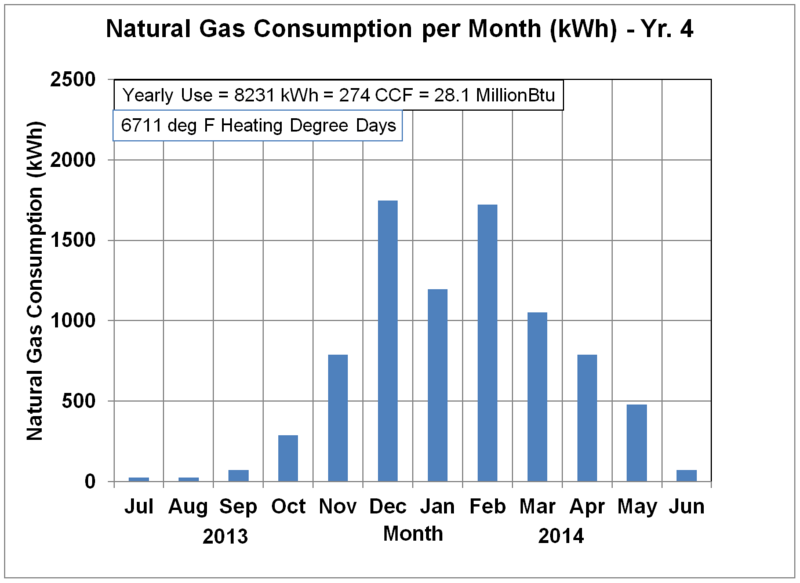 Therefore, the total natural gas consumption through the heating season of 7049 HDD (deg. 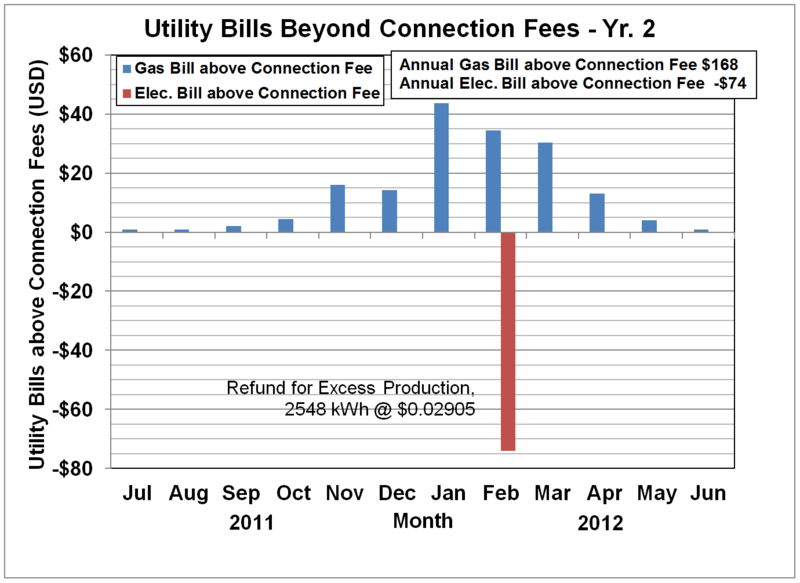 F) was 6608 kWh or 220.3 CCF or 22,546 kBtu. 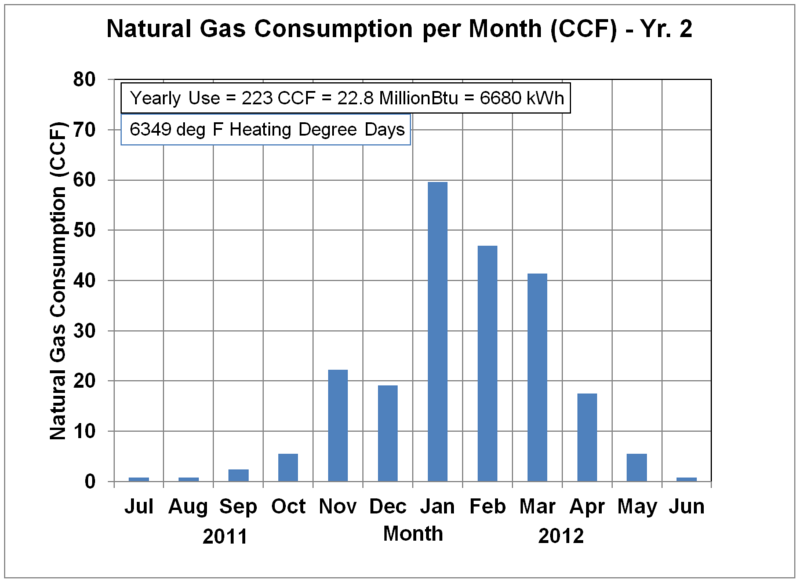 This usage through the winter of 2010-2011 would correspond to an energy use of 2.0 BTU/HDD/Sq.Ft., placing it in the best category in the table above, being less than 5.0 BTU/HDD/Sq.Ft. 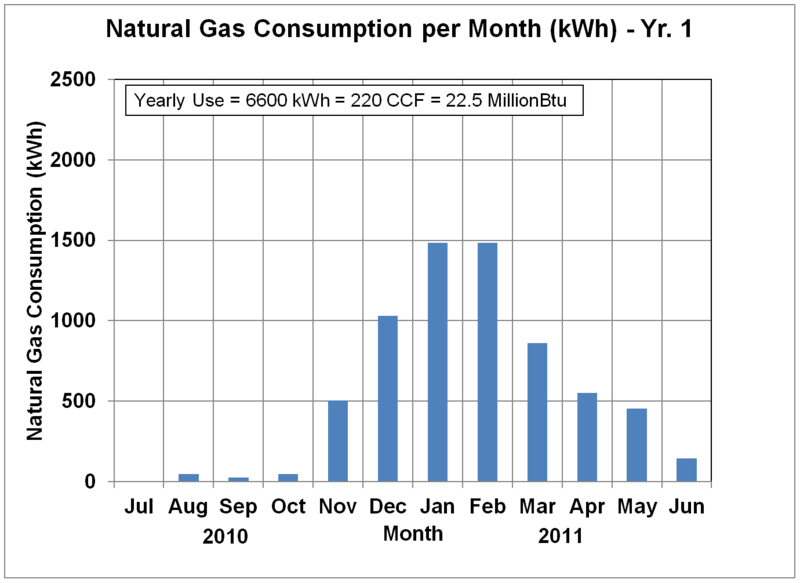 More importantly, it easily met the net-zero source energy goal, as demonstrated in Net Energy Use. The heating costs have been very modest as shown in the figures below, with the first figure for year 1, and the second for year 2. 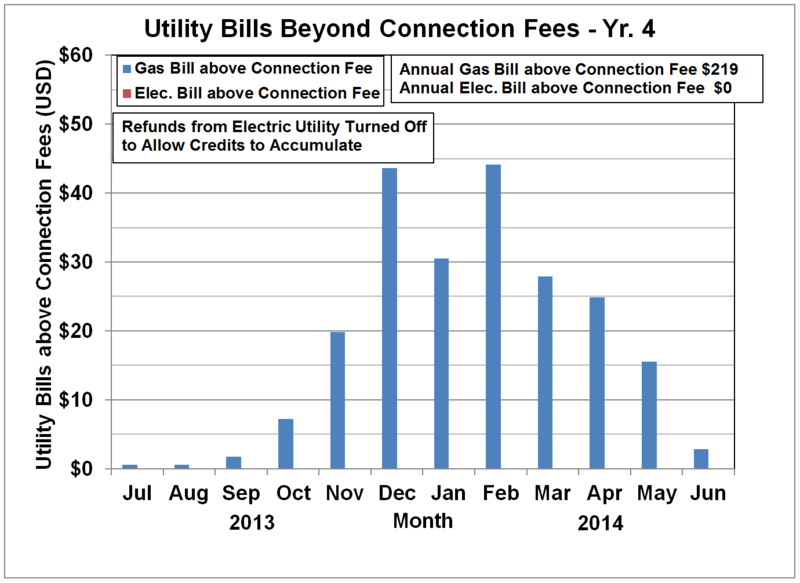 These costs are those beyond the connection fees. 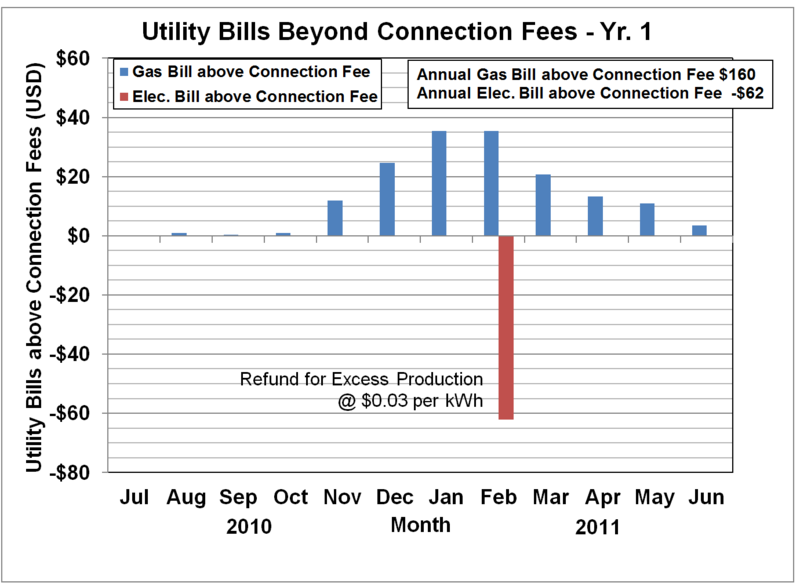 The connection fee and taxes for the electric utility are $7.40, and for the gas utility are $11.11.